Your Insider Guide to the best Phuket Beaches : Choose Where to Stay in Phuket ! Thailand, Phuket : think sun, swimming in clear blue water, golden sand scrunching between your toes, endless nights of sipping cocktails as the blood red sun slowly slips into the silvery reflective ocean. The flip side to this can be stormy skies, drenching rain, dangerous ocean currents and howling gale force winds. But, you are in the tropics, so no matter what the season it is never cold. The west side of Phuket has the most beautiful alluring sandy beaches, as the east coast is tidal and full of mangroves for the most part. In most populated beach areas you can hire deck chairs, umbrellas and towels. My preference is to always have a sarong in your bag as it can become a scarf, a towel, a sun cover up and if you find yourself without swimmers and the heat gets to you, wrap it around your sweaty body and go for a swim. A cautionary note – many drownings occur, so be aware of the beach conditions and if there are flags on the beach, don’t ignore them. Green flag is no danger, so swim until your heart is content. Yellow flag, you swim at your own risk so in other words, I would not advise going in. The universal flaming red flag of course for danger, definitely is a warning that you are an idiot if you go in. To totally escape the maddening crowds, head to Nai Tai Beach, which has absolutely no facilities. But, there are no people either. It is a gorgeous stretch of yellow sand and inviting water. Head over the Sarasin Bridge, which connects Phuket to the mainland and follow the signs to the hot springs. This stretch of paradise is beginning to see the emergence of some world-class luxury boutique resorts such as the latest one to open, Iniala Beach House. Sala Phuket Resort and the J W Marriott Hotel together with quite a few other accommodation choices sit on this stretch of blissful sand. Again, being the “airport” end of the island, it is away from the bulk of the tourists and the beach is not a highway of Thai vendors wanting a piece of you. 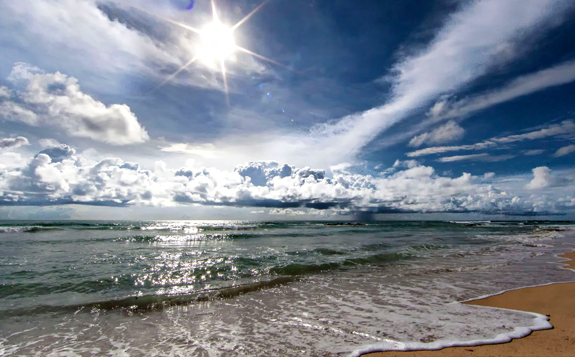 However, during monsoon season, the ocean has huge waves and strong currents. This area is definitely for those who wish to get away from people en masse. I personally love this beach area where the Indigo Pearl Resort sits. It is what I refer to as restrained Thai beach culture. Think small B & B’s, or rustic cabins, cafes and bars together with great seafood restaurants. Within minutes you can get away from the central beach village, and escape for a quiet walk. It is on the cusp of the Sirinat National Park where the Thai locals converge for their Sunday family picnics. To me it is the best of both worlds. The only drawback is when the tide goes out, you have to walk forever to have a swim, as it is a shallow beach and the water can become quite warm during high season. Another favorite of mine, I love this beach for its endless clean swimming and the clear visibility of the water. 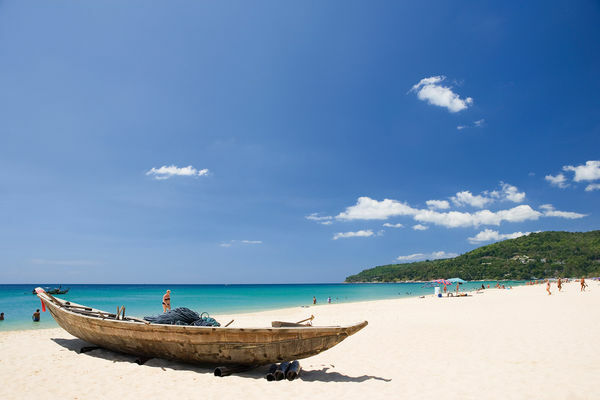 The Pullman Phuket Arcadia Resort sits proudly on the northern end of this beach. The southern end is not as crowded and it is away from the other hotels. Here the deck chairs do not dominate the sand and are a decent space apart. This is a deep-water bay and as such was not affected by the 2004 tsunami. There are the usual beach shack restaurants and huge shady trees can be found with a lively coral reef at the southern end, which is great for snorkeling. A little gem of a beach, it can be found by locating the area where there are cars parked on the side of a bend in the road before Nai Thon Beach. There is only one small sign that quite often isn’t in situ. To get to it, you have to scramble down a track but it is worth the hike as there is only one restaurant and very few deck chairs. The specialty of this restaurant is barbecued fish, which is caught fresh each day. Great for escaping crowds, this is the northern end of Bang Tao where a river and a lagoon meet the ocean. Many locals use this area to take their dogs for a walk, as it is a great stretch of predominantly empty and endless beach. Huge trees form a shady apron to the sand, so beware of the mosquitoes at sunset. There are small clusters of bars/restaurants and the yet to be opened international brand, Nikki Beach Club, is soon to open its newest venture on this stretch of sand. The exclusive Trisara Resort flows onto this beach and The Pavilions Resort has unparalleled views, being on a cliff top overlooking this area. A shallow long beach populated by numerous hotels, restaurants and bars, this area was badly affected during the 2004 Tsunami. The southern end of this beach is a colorful haven of long tail boats that can be hired for day trips to outer islands or just to another beach, if you don’t fancy driving the roads. My favorite beach, except during high season when it is awash with deck chairs, umbrellas and those people who wish to be seen strutting their stuff on the foreshore. 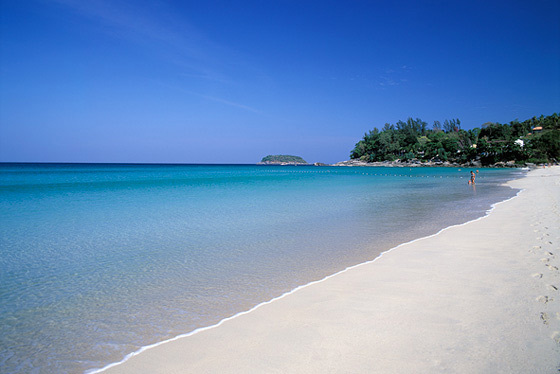 Being a deep bay, it was not affected during the tsunami and The Surin Hotel and Amanpuri sit on the northern headland. It is the home to many upmarket beach clubs including one of the original ones on Phuket by Twin Palms Resort, Catch Beach Club, which thrives on tourists with deep pockets. There are no hotels directly flowing onto this beach as they are all in the street behind the beach park. Twin Palms, Double Tree, Chava and many more luxury resorts are found in this area. If you want a bit of people watching, head for Laem Singh Beach, which is between Surin and Kamala. Unfortunately you will be charged for parking. The tricky hike down to the somewhat secluded beach is worth the trouble. Whenever I am there, it does not appear to be a “family” beach, but more a playground for adults especially of European persuasion. There are great rocks in this small bay and incredible snorkeling. Equipment can be hired from one of the little beach shacks. A long stretch of sandy beach that really is only busy during the high season. Shallow water that goes on forever, there is nothing really defining about this area that appeals to me. During the monsoon season it seems to be the magnet for any floating debris to land on. A tourist hot spot and not for the discerning traveler, but then again, maybe it needs to be visited once to experience the atmosphere. A constant party town: bars of either the girlie or katoey persuasion; huge restaurants that feed masses of people during high season; cheap dvds, t-shirts, sarongs; and constant questions of “where do you come from”, “wanna mah-sage” or from the lurking tuk tuk drivers “where you go?” The beach itself is crowded with not only sunburnt bodies, but jet ski operators, sleazy old men, restaurant and bar shacks, beach shops, hawkers selling everything that you can find in the shops and fortune tellers all trying to squeeze a tourist out of his money. It is littered with massage beds and deck chairs shaded by umbrellas. You guessed it, this is the beach you go to for entertainment value only, as you will be harassed and harangued constantly which obliterates any good aspect of this wide stretch of sand. After Patong there are numerous beaches such as Karo (pic 1), Kata, and Kata Noi (2)all awash with beach goers, accommodation of various styles, restaurants and bars. A locals haunt and great for families, this somewhat quiet and picturesque bay, is pristine and a great way to spend a day relaxing. Dominated by boats and a long jetty, this is not really a “beach” in my opinion. It is great for seafood lunches; hiring long tail boats and just chilling out watching the world go by. Do remember Thailand is a third world country and has as yet to catch up with the environmental conscience the Western World has. The beaches in some parts can be littered with plastic bags, bottles, thongs and anything else including the odd drowned body, depending on tides and locations. There is also a major problem with water runoff from the hills and hotel effluence, which the government is yet to restrict. Never swim near a “klong”, a water runoff collection point or a stream that runs into the ocean. You will be leaving yourself open to ear and throat infections from the contaminated water if you do. There are no fearsome swimming creatures, but occasionally stingers can be a problem. The saving grace for any of these issues, is your resort’s swimming pool if need be.